New architecture students used to call it “breathing space” in class. Negative space is the area around an object. It’s nothing, but it has an important role in the way we design homes and rooms. This absence keeps things balanced, helps us focus, rests our eyes, and creates harmony in the space. It is a minimalist designer’s most powerful tool. Negative space can eliminate the distractions to highlight an object and heighten its impact. From this angle, you can see that the homeowner wants to highlight the beautiful stone walls and her modern chandelier. 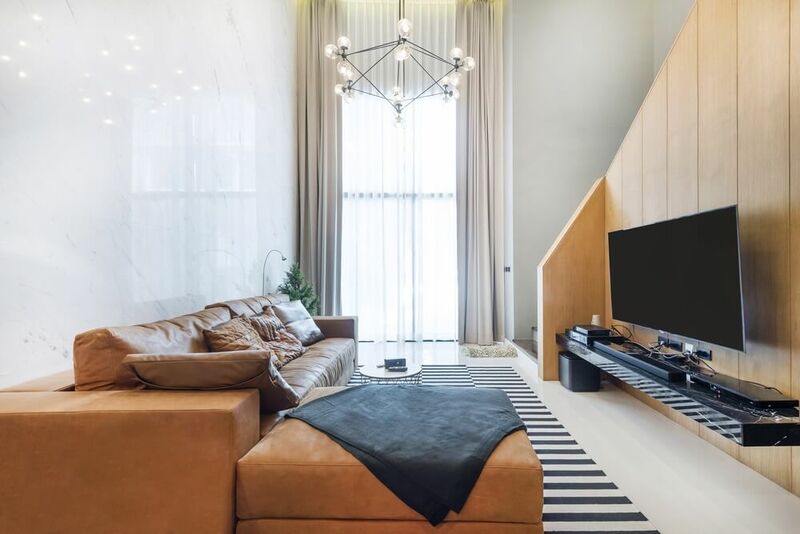 The walls, windows, and even the furniture in the space don’t overpower the two design elements. In the table, the table and the chairs are the perfect backgrounds to a nice floral centrepiece. 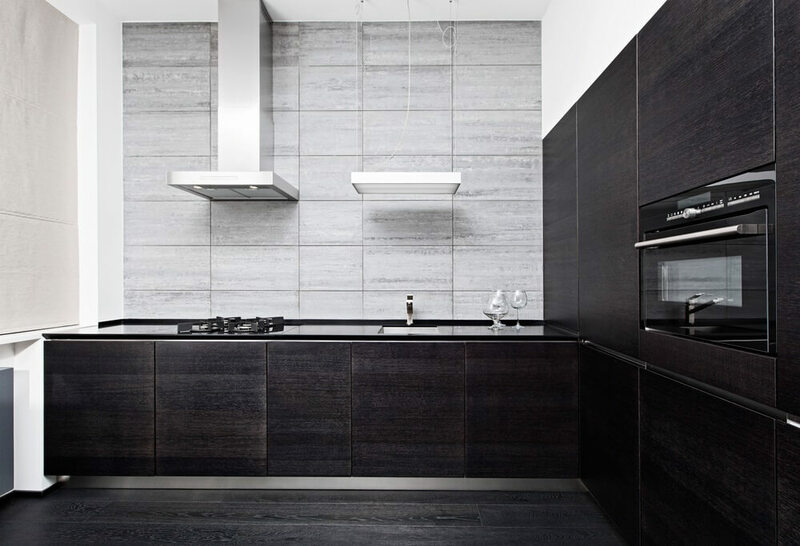 First, the designers emphasized the exquisite black kitchen using the large black granite slab. 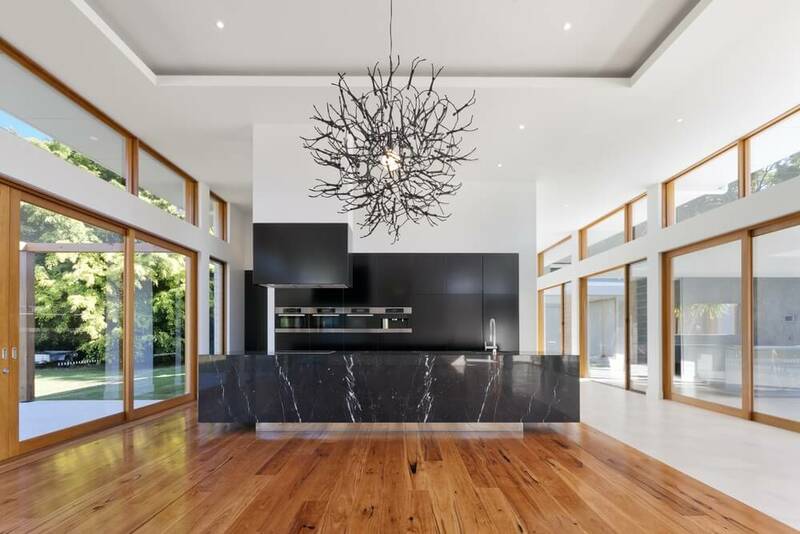 Then, they hang an attention-grabbing, dark coloured chandelier which relates to the black kitchen. Almost all homeowners want more storage in their kitchen. There’s the upper and lower kitchen cabinets, pantry, kitchen island drawers, etc. Unfortunately, not everyone can fill these spaces up. If you do, there’s a high chance that you’ll deal with a clutter problem in the future. Here’s the thing: upper kitchen cabinets are hard to reach (sometimes). If upper cabinets seem impractical for you, remove them. It will give your kitchen more breathing space. Here, the absence of upper kitchen cabinets enhanced the stunning tile splashback. The range hood and the pendant light also drew more focus to the lower cabinets. Imagine the sink and the round mirror in the exact middle of the counter. Yes, it still looks great but this arrangement is more interesting. It also allowed more counter space on one side. Negative space highlights the asymmetrical elements together, making them more noticeable. 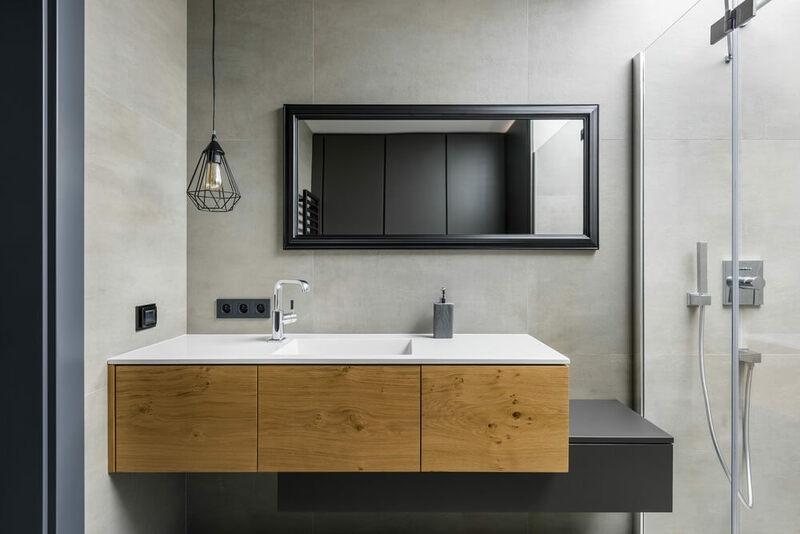 See how it made the counter and mirror stand out in the bathroom space below? 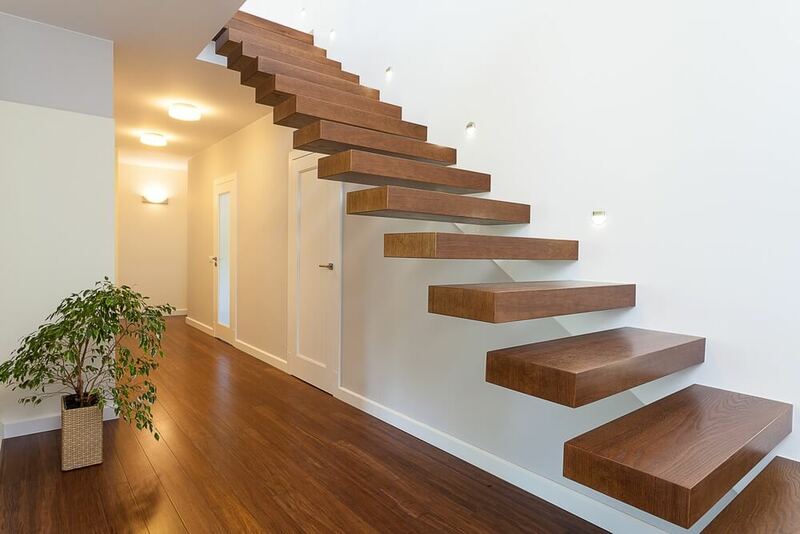 Negative space makes these floating stairs work like magic. The stairs, flooded with light, becomes the star of this space. 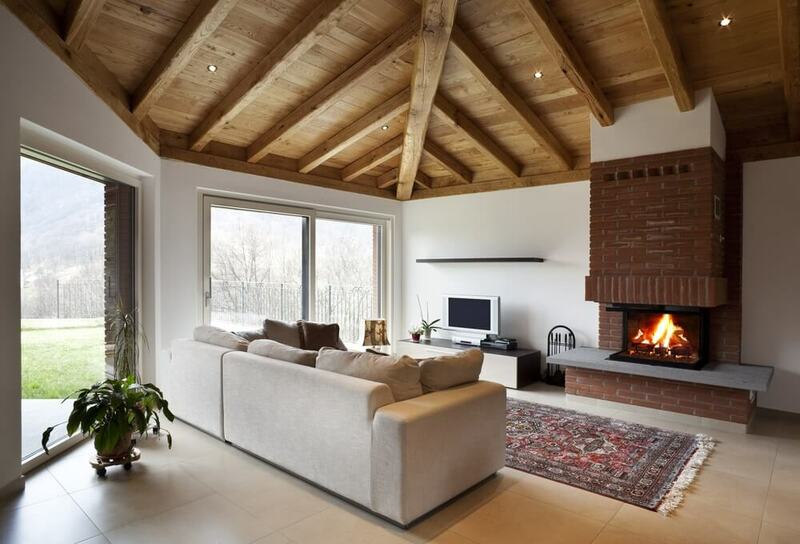 Thanks to negative space, you’re drawn to the fireplace and the ceiling of this home. 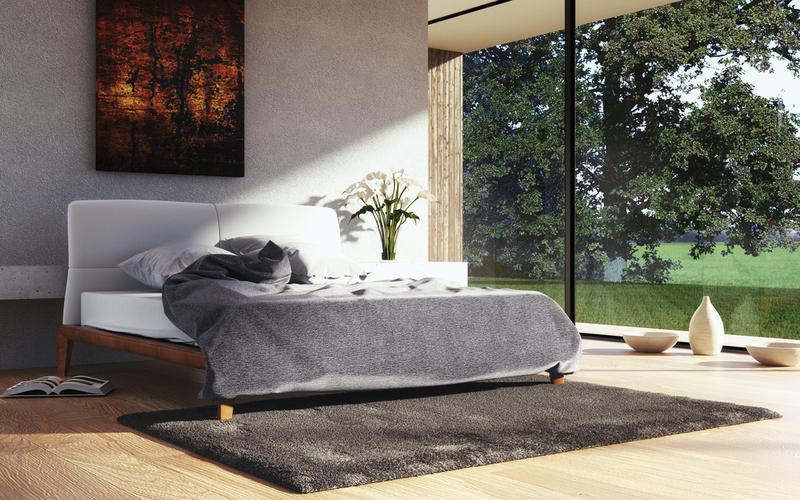 The glass wall is a dominant element in this bedroom. Putting a window treatment in a large glass wall like this unneeded. Leave it as it is and enjoy the outdoor view from your cosy bed. If you push the regular coffee table to the side of the sofa, you can make room for the foot traffic. 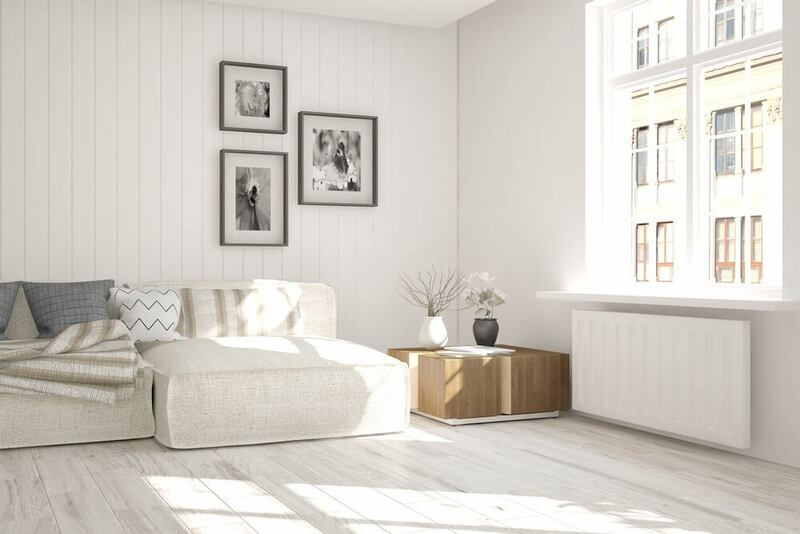 It also gives the living room a cleaner and calmer look. Feel free to place a bold rug to add some character to the room. Superdraft tip: Can’t lose the coffee table? Use something small. The round coffee table you see in the featured living room above is small, it doesn’t cover much of the rug’s design. 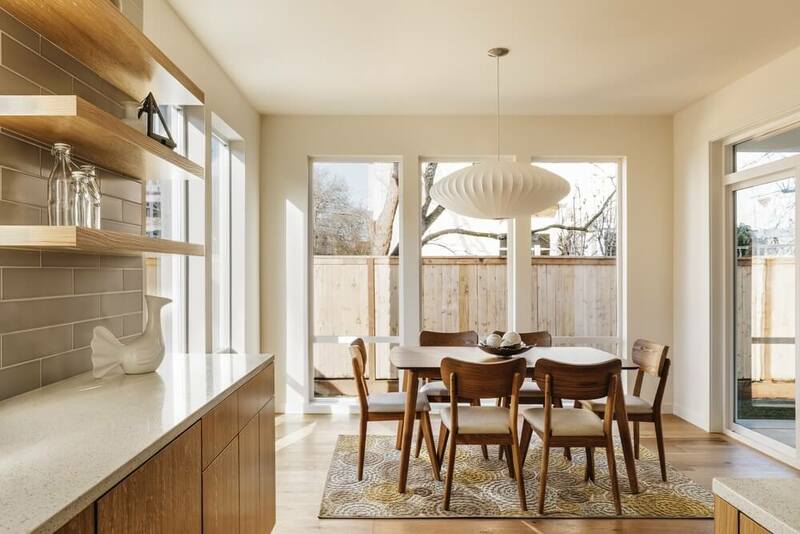 The midcentury modern dining tables and chairs offer a balance of positive and negative spaces. It looks light, airy, but sturdy. Overall, using these furniture pieces in the dining area makes the room peaceful. 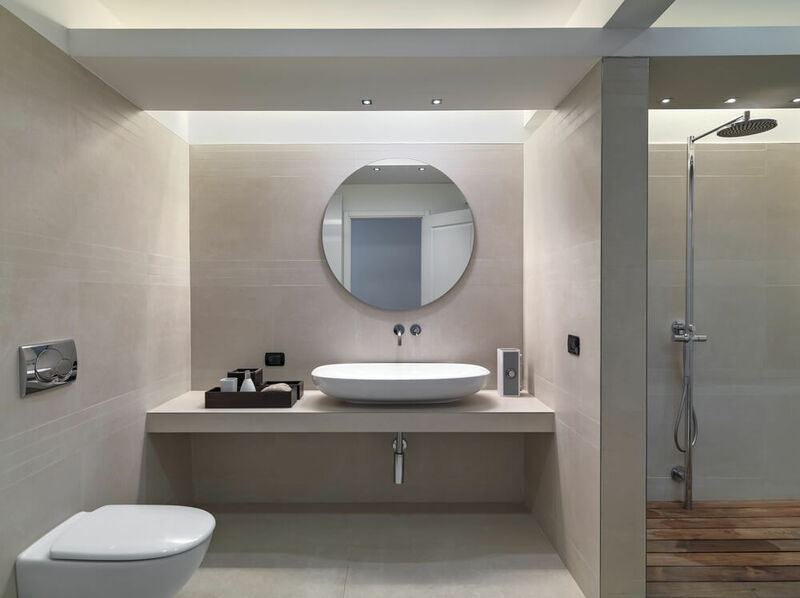 Take a look at the featured bathroom’s floor below. Focus on the pattern. See how the white areas made the tile and the floor alive? In black and white patterns like this, the positive and negative areas are reversible. Remember, negative space is not always white. 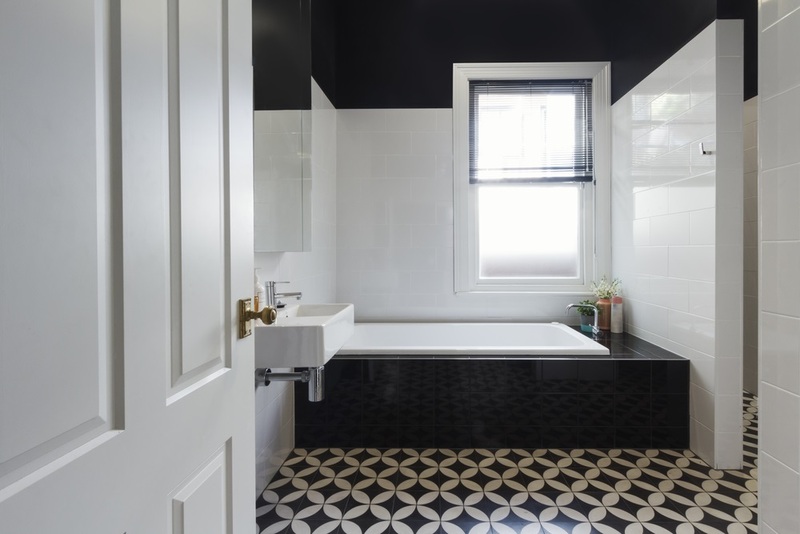 The negative space shown in the tile flooring is either the white or black area—it’s up to your eyes to decide. The easiest way to harness negative space is to leave some places empty. All you need to do is make room so the pieces of furniture or decor you want to highlight will be noticed. 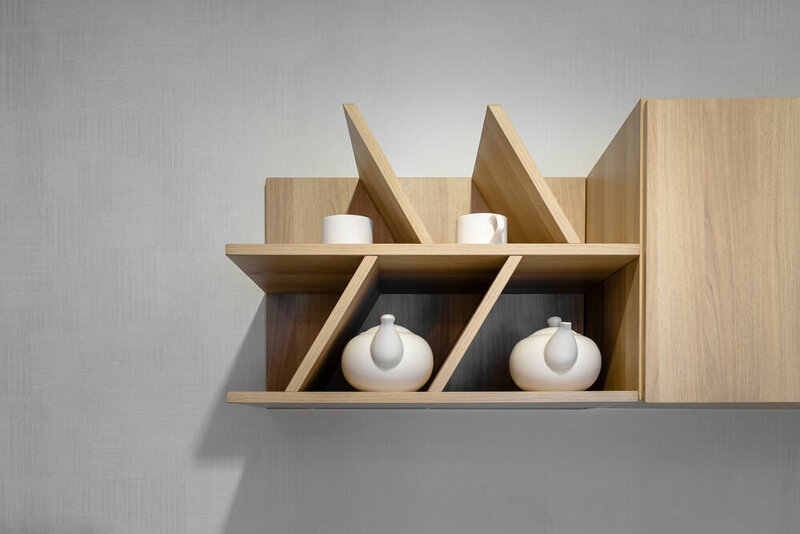 You can start by controlling the number of things you display on your shelves. Leave some of the shelves empty. Doing so will direct most of the attention to the items you want to highlight. 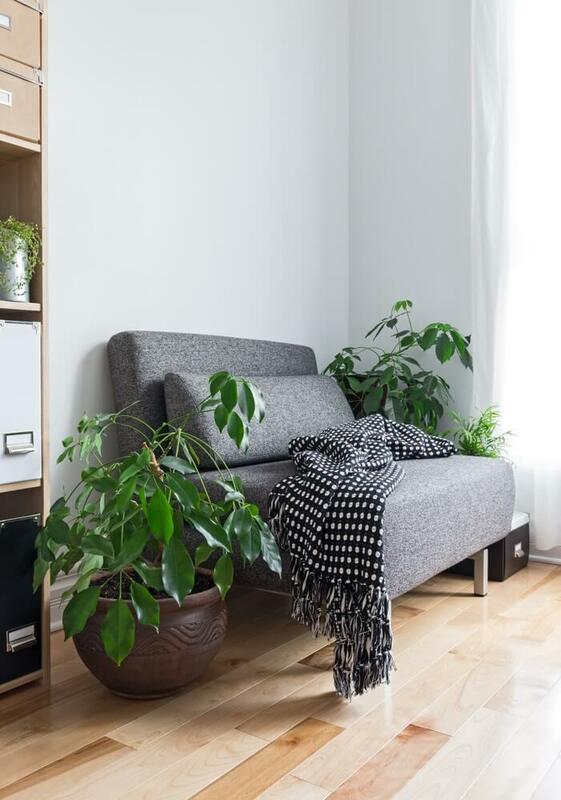 Another way is to avoid overdressing your chairs and couch. The absence of colourful throw pillows tames this seating area, allowing it to blend naturally in the room. Finally, resist the urge to decorate a blank wall. Doing this on the wall right above your bed will help direct most of the attention to the bed. 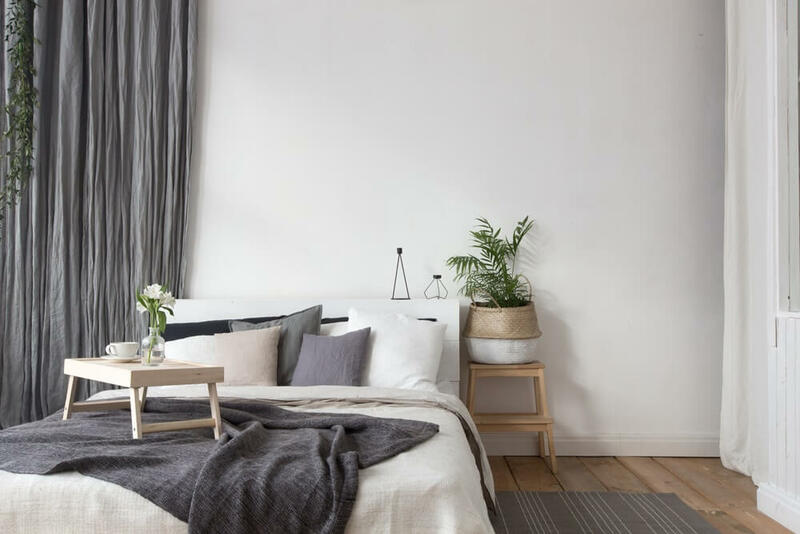 Don’t hang anything—just decorate the bedside or make the bed comfy with more pillows and soft fabrics. Whether it’s a new home or a renovation project, our architects will help you design your home‘s interior. Let’s use the power of negative and positive space to enhance your humble abode. Take a look at our design gallery to see our previous work.